Last edited by DesertWee-Strom; 12-23-2013 at 12:39 AM. Loosen the top nut by turning it clockwise as you look down on it and swivel to stalk where you want it. Then tighten the nut in the other direction. You may need to hold the bottom part in place for the final tightening as it can loosen if you turn the top nut too hard. Duh!, Thanks very much for that, just bought a new 650, and was trying to adjust the mirrors and couldn't work out why it wouldn't loosen, the mirror came off the bar mount ok, as that was RH thread, but no idea that the adjuster was LH, thought I'd leave it in case I stripped it. Thanks again very much. 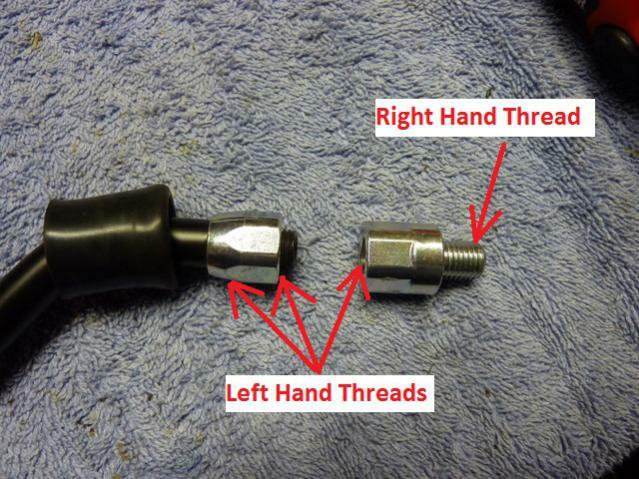 The information in the thread above about the threads for the right piece in the first picture is incorrect. This is the piece that screws into your mirror stalks mounted on your handlebars. The thread is M10 x 1.125. Not M10 x 1.5 It is a normal right hand thread. M10 x 1.5 is very common and can be found in most hardware stores. M10 x 1.25 is less common, but still available. Use of M10 x 1.5 bolts will damage the female threads in mirror stalks. I don't know of any mirrors that use an M10 x 1.5 thread so if your replacing your mirrors the point may be moot. Mirror Extenders - AdventureTech, LLC. M10 X 1.125 ? I think you mean M10 X 1.25 correct? Good catch. I edited the post. Ok sorry to be acting a bit dumb but I've logged in and out,refreshed as well as changed threads and I still can't see the pic in the the first post???? It's still there. Are you possibly at a work computer? Sometimes IT sets them up to deny access.